Our Engagement Team at Blackline Safety has begun hosting weekly webinar training sessions open to everyone– whether they are current customers wanting to refresh their memory or new customers going through the initial Onboarding process. These two weekly sessions currently focus on educating viewers on the Blackline Live portal and the Loner M6/M6i devices. 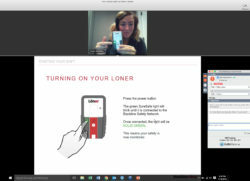 The Loner M6/M6i webinar will provide an overview on how to use the device, understanding what it is telling you and an in-depth explanation of all of the dynamic features. The Blackline Live webinar is geared to anyone who has access to a portal account and will demonstrate how to create alert and configuration profiles, add contacts, manage alerts and will explain what all of the different configurations mean. The webinars are provided through GoToWebinar.com and have a chat feature so viewers can ask specific questions live and have them answered immediately. It’s a simple and efficient way to learn and communicate with us directly– sessions only run for 30 minutes. We are excited to see where this takes us, and we will be adding different types of webinars in the future! Schedules and links will change and be posted each month. « previous postAlarms don’t save people. People save people.